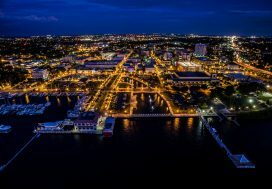 “Monday night, the beloved former downtown Tampa restaurant, Fly Bar & Restaurant, teased us with a cryptic Instagram post about its new location. LandQwest Commercial is honored to announce that the company has been named as a 2018 Top Leasing Firm and Top Sales Firm in Southwest Florida by the CoStar Group, Inc. In addition to the esteemed corporate recognition, three of its Southwest Florida team members were acknowledged for being top producers in their field. International commercial real estate leader, Robin Webb, CCIM, CPM, CHA, CHB, joins LandQwest Commercial to oversee brokerage operations as Senior Managing Director of the greater Central Florida region. In this capacity, Webb will mentor the firms’ production team, attract new talent, and catapult the brand’s presence in Orlando and Tampa Bay. LandQwest Commercial Real Estate Services continues its expansion efforts with the launch of its Naples, Fla. office. This will mark the second Southwest Florida office and fourth overall for the full-service commercial brokerage and property management firm, which will operate out of the Kraft Office Center at 3555 Kraft Rd. #260 in Naples, Fla. The caliber and location of this class-A destination was integral to representing Collier County owners and tenants, and to growing its team of prominent commercial producers. LandQwest Commercial is proud to announce that Mary Gentile, CRX, CSM has been named President of LandQwest Commercial Property Management, LLC for the state of Florida. Mary co-founded the Management Division in 2006, and as it approaches its first decennial anniversary, [Gentile] has increased their square feet under management by 67% since its inception. The current portfolio sits at 2,000,000-square-feet, which has fluctuated as a result of varied market conditions. In 1Q18 alone, the company witnessed monumental growth by way of a 67% portfolio increase and 67% staff increase, introduced a cloud-based advanced management platform for owners, and offered a 24/7 digital emergency response program for tenants.